This is Nancy’s Embroidery Shop. 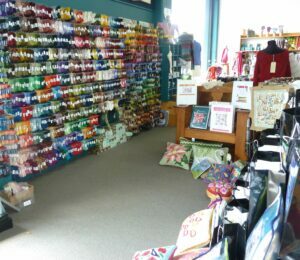 It is the closest needlework shop to where I live, which makes it my LNS (Local Needlework Shop). Much closer is a branch of one of those chain stores that sell a lot of what you need for most crafts. You know those places – there’s one in almost every town now. They’re huge and can afford to sell at a cheaper rate plus they send out brochures on sales every other week. 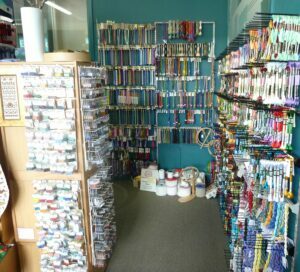 Although the chain store is much closer and less expensive I would still rather buy my needlework supplies at my LNS. Why? Because I’m not just paying for the product; I’m also paying for valuable advice on my specific craft. Because sometimes I require special fabrics or accessories that are too specialized for the big, general craft stores to carry. Because I love the ambiance of the LNS – I feel inspired as soon as I step in the door and see all those cottons, beads, fabrics and – oh – everything. And because I fear that if too many customers turn away from their LNS and spend their crafting cash at the big chain stores I will lose all that. Please support your LNS. This entry was posted in Uncategorized on February 19, 2015 by Elli Jenks.